And the funny thing is that all those new feelings and emotions are so intense, that your whole day-long experience goes by in a flash. Things happen so quickly, and you can't really stop mid-flight to savor the moment. One second you're on the ground getting geared up, and before you know it, you're back on the ground, unsure if that unbelievable ride was even real or not! And all you want is to feel that rush again! 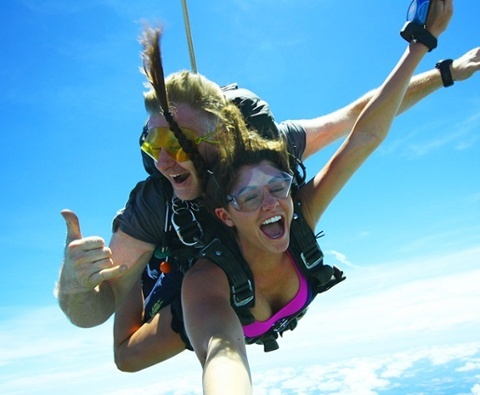 If anything lets you preserve those intense feelings and relive them anytime you want, it's the skydiving photos and videos that you get from your jump. You can only have your first ever jump once, so it's not even a question that it's worth hiring a videographer to capture those unique memories for you. If there is one thing that all our customers say, it's that the videos and photos are absolutely worth getting. And from our side, seeing people barely able to contain their excitement while watching themselves skydive, and having the whole heart-pounding experience come back to them, is really priceless. 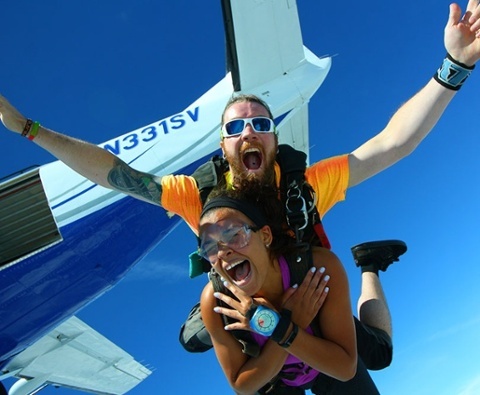 We're sharing our top 5 most important moments to capture on the day of your first skydive, to let you prepare for your most badass photo shoot! Geared up, briefed, and more excited than EVER before! It's fun to see yourself with that big smile, not quite knowing what's going to happen in a few minutes. Make sure to get your whole group on the photo! Skydiving photo #2: The climb! Your videographer will make sure to take a photo of you in the airplane. Chances are you will look super stoked and maybe a little scared too! It's okay, we have all done it for the first time. 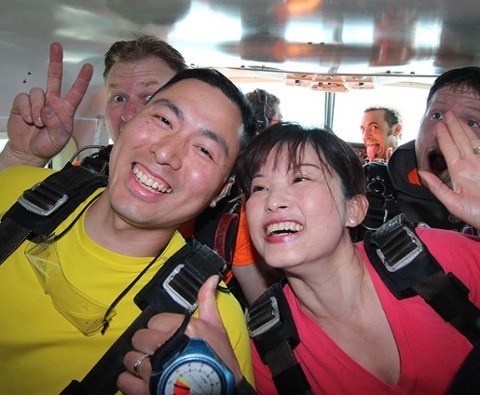 Most of us skydivers would actually give a lot to have that one photo of us in the airplane on the first jump ever. Because minutes and seconds from then, your definition of FUN would be changed forever. You would become one of us - skydivers! 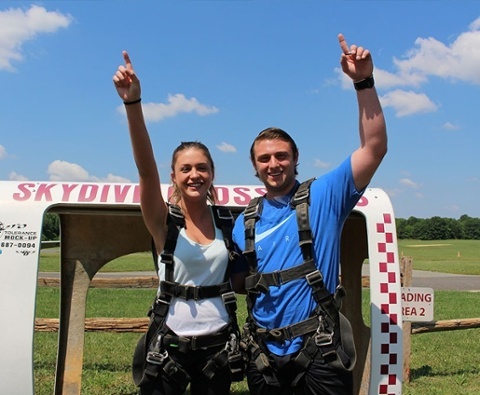 Skydiving photo #3: The exit! 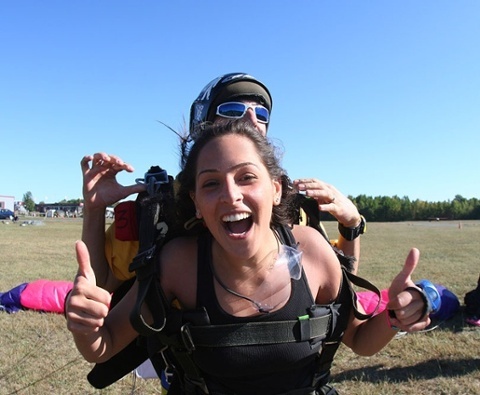 This is my personal favorite of all skydiving photos, the one documenting the BIG STEP you took out of the airplane door. The expression on this one is always priceless. The second you realize that there is no way back, and you are DOING it! The airplane is already behind you, there's nothing to hold on to and all you can do now is spread your "wings" and fly! The excitement, the adrenaline rush, the surprise of a completely new environment, it's all written on our faces on that one photo. 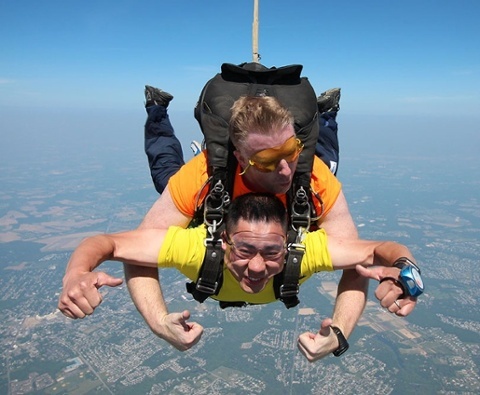 Skydiving photo #4: The freefall! This is the classic skydiving photo that people like to share. You are FLYING through the sky, completely free, at a crazy altitude, crazy speed and actually having the time of your life! The videographer flies around you, looking like a spaceman, holding your hand and trying to take all the best shots for you. 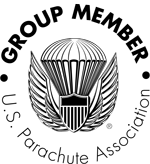 You don't realize that an entire minute goes by until the instructor pulls your parachute open. You're actually not thinking of anything at all. You're just there, in the moment of complete freedom and happiness, enjoying the hell out of it! 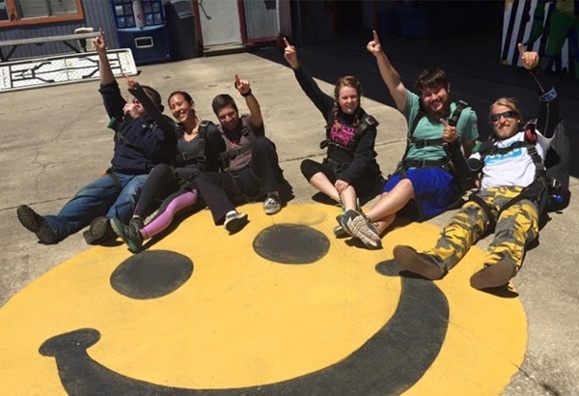 This is the feeling that comes back to you every time you look at this skydiving photo. You've done it, and here's proof! 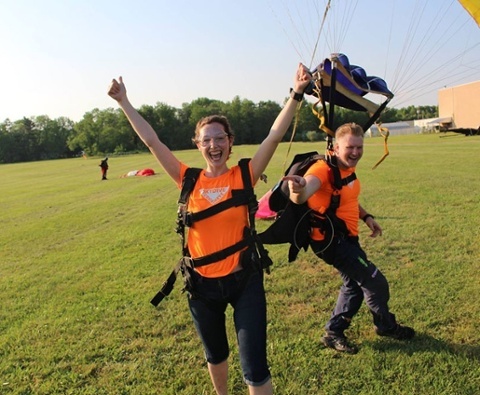 Skydiving photo #5: Just landed! The moment your feet touch the ground, all the emotions come out! You've done it, you're back on the ground, you've just had the most exciting minutes of your whole life, experienced real human flight, caught some incredible views and had been bitten by the "sky bug". You are not the same anymore! You've lived the adventure and you've seen the earth from above, and the one thing you're thinking right now is, can I do it again please? Capture this moment of happiness, energy, relief, and feeling superhuman. Go back to that photo whenever you need an extra boost of super powers! Caution, it WILL make you come back to the drop zone and do it again. And we'll be here ready for you!